2014 Westrey, Chardonnay, Oracle Vineyard, Dundee Hills, Willamette Valley, Oregon. Westrey Wine Company, a small producer of Burgundy style Pinot Noir and Chardonnay was founded back in 1993, at about the same time as many of the second wave of top winemakers got to Oregon, they are from that same core group with Mike Etzel of Beaux Freres, Mark Vlossack of St. Innocent and John Paul of Cameron to name just a few, and they were one very few that saw the potential in Willamette Valley Chardonnay. Westrey represents the collaborative winemaking efforts of Amy Wesselman and David Autrey, and have been a team for a long time in the region, Amy and David source fruit from some of Oregon’s premier vineyards, including their own estate plantings in the Red Hills of Dundee. The Oracle Vineyard, where is old school Chardonnay comes from is an old vine site on the Jory (red volcanic) soils in the Dundee Hills AVA which was originally planted in 1977, and in this 2014 vintage, a wonderful year for Oregon, they got perfectly balanced fruit from these elderly vines. Working old school and using traditional Burgundian methods, Amy and David under still under the radar outside of Oregon, but craft beautiful wines that deserve a greater audience, and in particular this intriguing Chardonnay. The layered and opulent 2014 Oracle Chard starts with a nose that flirts with perfume and toasty leesy elements with a deep golden hue in the glass showing white flowers, lemon curd, brioche and peach tart before leading to a medium/full palate of apple, pear, apricot, spicy clove, wet rock, butterscotch and white anise, which reminds me a bit of Corton-Charlemagne! 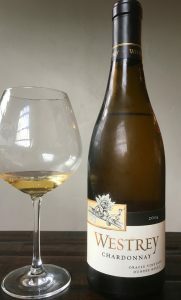 Gains a bit of weight with air and textural impact, but even as this smooth Chard moves into maturity it stays bright and focused, this Westrey has lots of class and glorious complexity, it is one of the finest Oregon Chards for the price, and is highly impressive. This is a wine that could age another 3 to 5 years, but it’s drinking top notch right now.